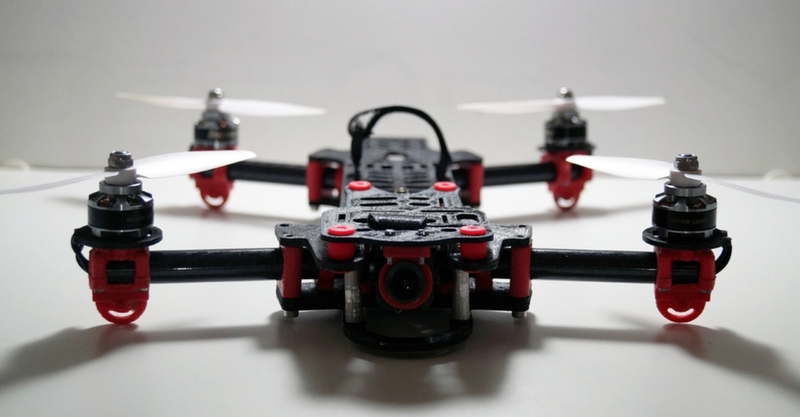 I absolutely love the idea of a 3D printed drone, or perhaps what’s more commonly known as a 3D printed quadcopter. It brings together so many of the cool elements of making something. You get to fabricate most of the parts yourself at home. You get to setup electronics and program transmitters and receivers. And then best of all, you get to fly the 3D printed drone you have just created. I used to dream about this stuff as a kid, when astronomical costs made buying a RC helicopter impossible. I am now the proud owner of an Align Trex 550L dominator, and despite being a mediocre pilot, it provides me with endless hours of fun. The only major problem is, every crash results in an expensive and time consuming repair process. If only I could 3D print new parts at home. Well with so many brilliant 3D printed drone’s available today, with detailed instructions on assembly and where to buy electronics, that scenario is now a reality. 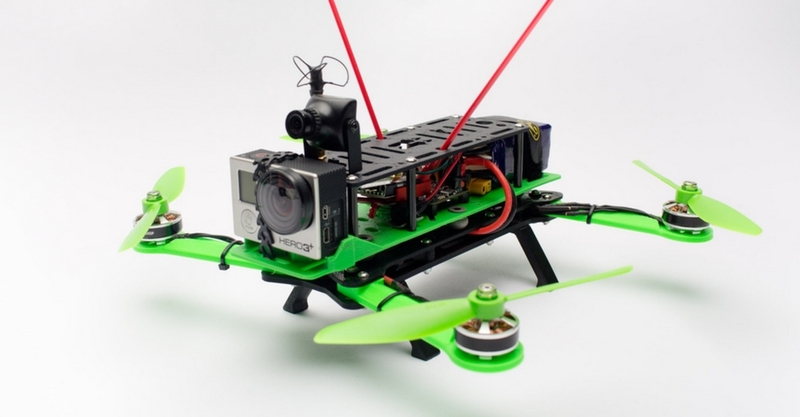 I was going to buy the excellent new Align FPV Racing Drone, but now I think I’m going to 3D print my own one. 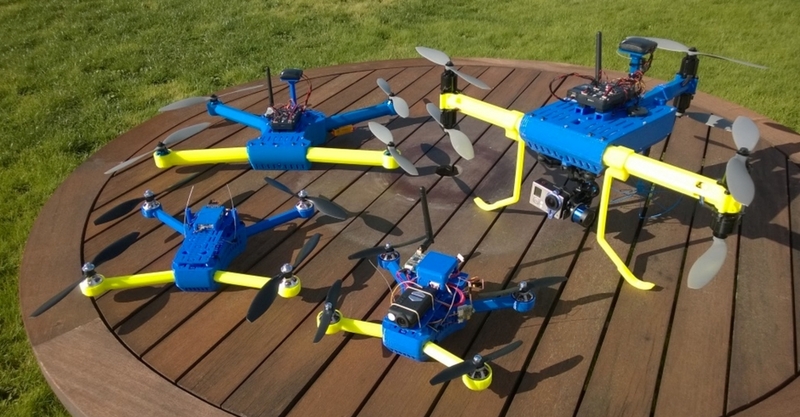 Let’s take a look at some of the best 3D printed quadcopter’s available today. If you have been involved in the desktop 3D printing community for sometime, then I am sure you will have heard of Daniel Noree. The Sweden based designer is responsible for bringing us the simply sublime Open RC Formula 1 Car. 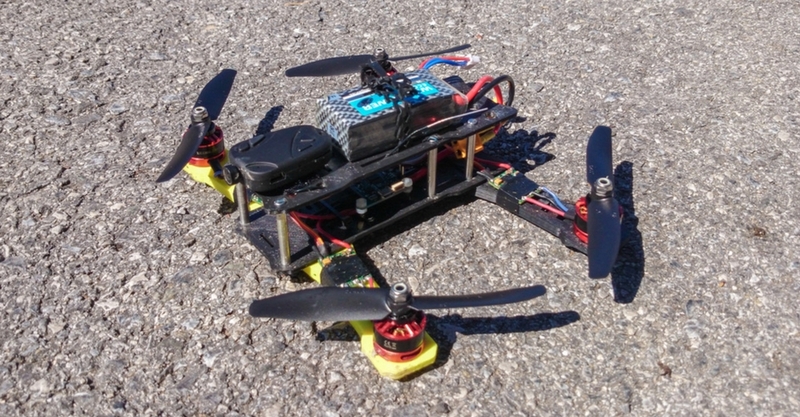 Prior to creating the 3D printed formula 1 car, Daniel worked his magic on an Open RC Quadcopter. 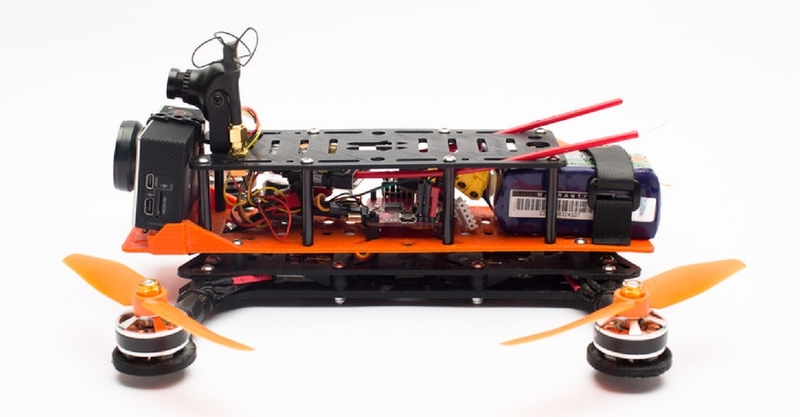 His 3D printed quadcopter is still in beta, and may lack the polish of the f1 car. 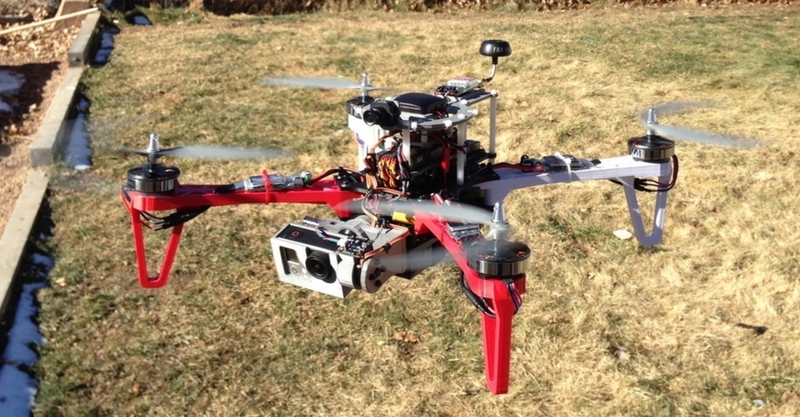 However, videos of the model in flight show clearly, that this quadcopter works, and works well. Of course the electronic components cannot be 3D printed, but everything else comes straight off the print bed. Once more, Daniel has intelligently designed this 3D printing model, to fit all the electronics from a DJI 450 Flamewheel. These components are readily available, and relatively cheap. 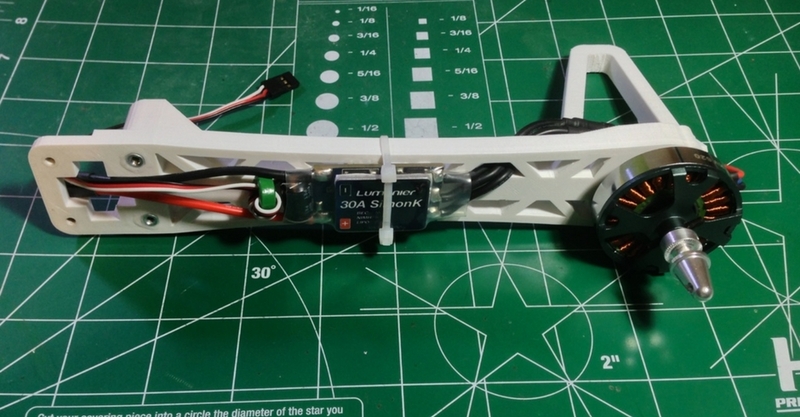 With regards to the electronics, what makes this 3D printed drone unique, is that all the electrical’s are enclosed within the design. No cables on show anywhere. That gives you a model that looks a lot nicer, but also that looks more like a professional store bought quadcopter, rather than a homemade job. Developing an almost cult following, with over 300,000 views on Thingiverse, the Hovership MHQ2 3D printed drone, is now in its second iteration. Hovership started out as a blog discussing quadcopter builds, but it has now expanded into designing, manufacturing, and selling components for RC aircraft. It has an excellent website where you can buy various parts, including the printed parts if you don’t own a desktop 3D printer. It also has detailed guides for the MHQ2: a components list; and a build guide. 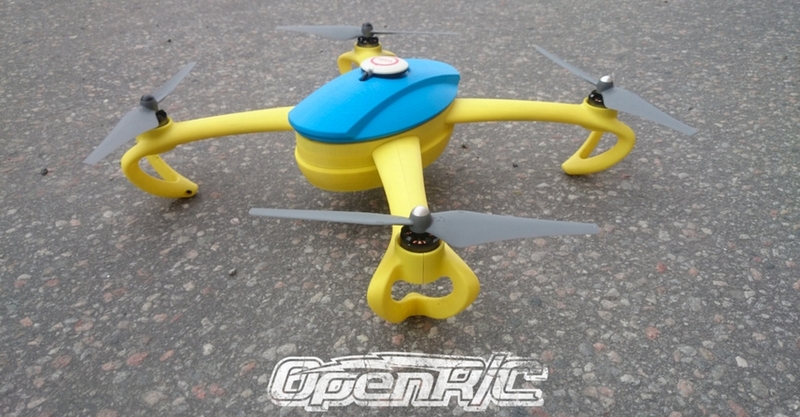 As with the open RC quadcopter, there are a number of components which cannot be printed. What’s important though, is that Hovership provides you with a complete list of parts, and links on where to buy them. Some of the parts you can purchase directly from its website. The build guide is very detailed, and with nearly 98 made on Thingiverse, there is plenty of community support if you get stuck. Because this is the mark ii version, most of the little niggles have been resolved too. There is a great video on Youtube if you want to see the Hovership MHQ2 in action. The Hovership Youtube channel has some other interesting videos also. 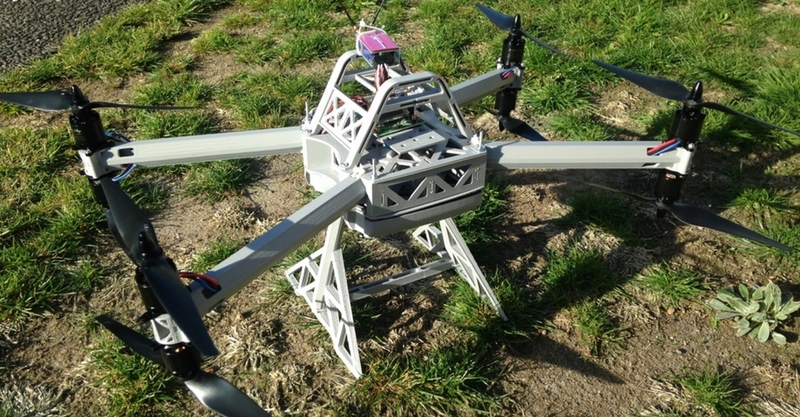 This is not the first time I have mentioned this awesome 3D printed drone on LayerTrove. 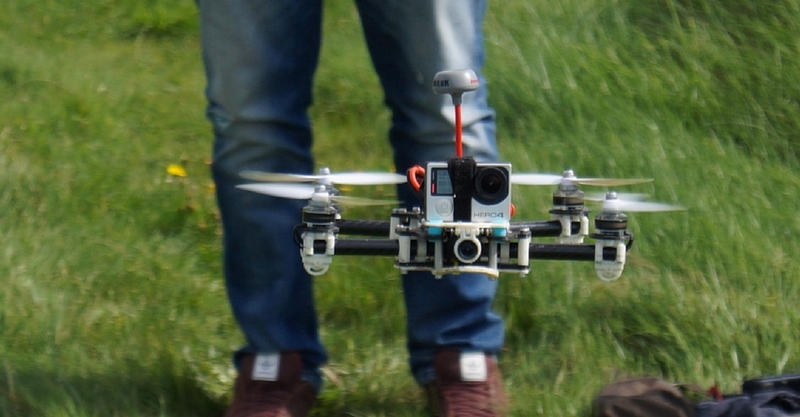 The Micro 105 FPV Quadcopter made our list of the world’s best 3D printing ideas. This mosqito sized 3D printing model, design by Ed Tumbusch, measures a tiny 105mm in diameter. Once built, it’s as light as a feather, tipping the scales at 38 grams. Inspired by two other maker models, the FireFlo V2 and the Alpine Drones Micro H, Ed wanted to create something light weight, crash resistant, with solid protection for the electronics. What’s great about the Micro 105 FPV Quadcopter, is the amount of thought that has gone into making it easy for others to build. You will find detailed step by step assembly instructions on Instructables. These include guidance on radio binding and setup, something which can be complicated for beginners. I remember spending as much time programming my Align Trex 550L RC helicopter, as I did building it! There is also a comprehensive parts list, with links on where to buy and alternatives for some of the items. A big thank you to Ed Tumbusch for putting in so much effort. The T4 Quadcopter Mini 250, designed by Brendan from New Zealand, is actually part of a range of 3D printed quadcopters. I chose this particular 3D printing model for the list, as it is the smallest and therefore the components required for assembly will be cheaper. Once you have dipped your toe in the water with this one, then you can graduate to one of the big boys. For the sake of comparison, the T4 Mini uses 5 inch props, whereas its big brother, the TX8 Octocopter, uses 10 inch props. Similar to the Open RC Quadcopter, the simple assembly uses zip ties instead of bolts, to reduce weight. Brendan has also created a serious of assembly tutorials, so that you don’t get lost whilst putting it together. There is a recommended drone kit you can buy from HobbyKing, which is low cost and contains all the electronics you will need. This is becoming a very popular hobby, so you are spoilt for choice if you want to upgrade to better components. The Sketchup file has also been included, giving you the option to make changes as you want. Daredevil Mike Bristol, when he’s not jumping out of planes or base jumping off of wind turbines, likes to develop 3D printed drones. His brilliant Crossfire is now in its second iteration, which means it’s simpler, stronger and easier to build. Leveraging the open source community to great affect, Mike made use of a years worth of feedback, makes and remixes, to maximise the development process. The results of that collaboration can now be seen in the Crossfire 2. It really is a testament to how open source can really further technology. For those of you who made the original Crossfire, the improvements are extensive. The highlights include: stronger arms, with a better strength to weight ratio; standardised to M3 hardware; and modifications to receive any type of flight controller. Mike has kindly taken the time to create a 24 page build guide. This guide is actually better than that of some major manufacturers, including Align. You will receive this pdf when you download the files. I think even a beginner should be able to follow these instructions with ease. There is also a fairly substantial community around this 3D printing model, and therefore plenty of help available. The Firefly by Janik Prophet from Bielefeld. 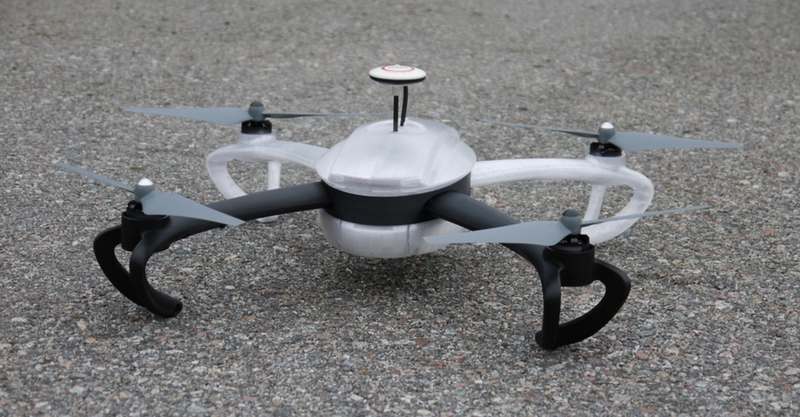 This 3D printed drone is so good, it’s even got its own website. 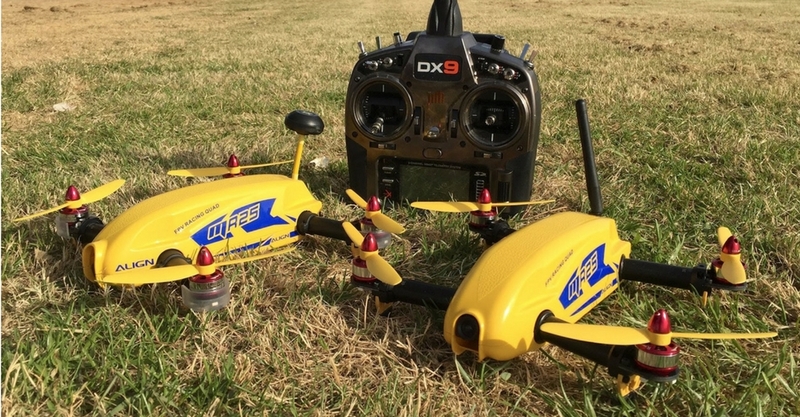 Described as a fully featured racing quad with amazing flight characteristics, it has been designed in a modular fashion, so that parts can be replaced easily. If you would like to see the Firefly in action, then check out this video on Youtube. It looks pretty stable and very fast. 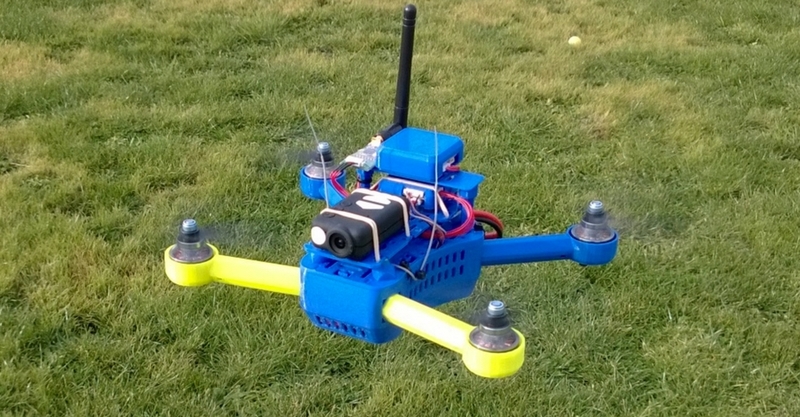 There is just copious amounts of information on Thingiverse about this 3D printed quadcopter. Lots of comments, lots of makes, and what looks like about 100 links to all sorts of useful resources. In addition to this, the Firefly website has a collection of detailed guides covering assembly. A full equipment list and printing instructions are of course included, but also specific details on how to manufacturer and build the entire model. Janik has also created the Firefly Pro, if you are looking for the latest model. However, this one is still a work in progress, so perhaps stick to the standard version for now. Ok, now time for a big boy 3D printed drone. You may recognise this one as part of the range of 3D printed quadcopters by Brendan. 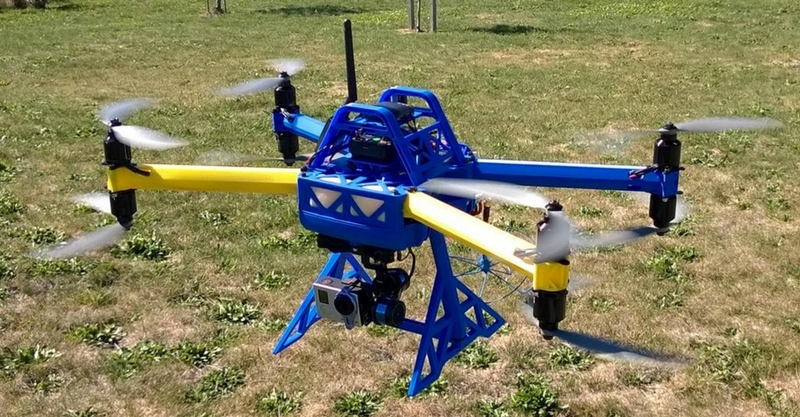 With no less than eight rotors though, this is a 3D printed octocopter. 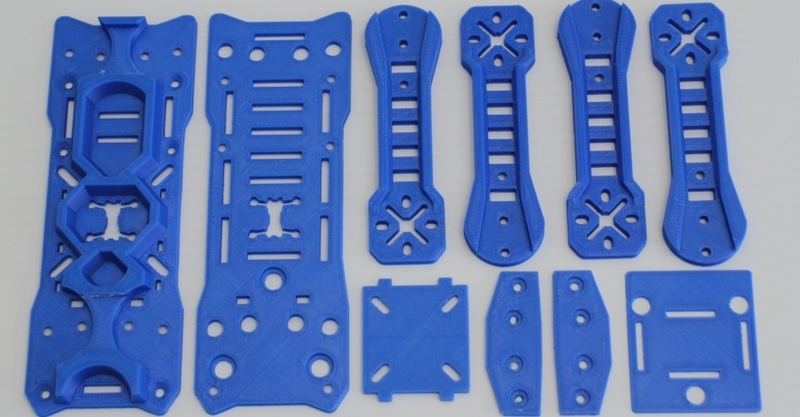 Be warned, the increased number of parts make for a more complex assembly, and you will need a print bed which measures 160mm x 170mm for the plates, and 225mm long for the arms. The longest print is only around 3 hours however. There is a good forum for discussing this particular model, and in deed the entire family of 3D printed drones created by Brendan. Given that there has only been one make on Thingiverse, this forum could come in handy. It is possible to 3D print this entire model without supports. A characteristic I personally put a high value on. The arms have been designed to reduce flexibility and stay as rigid as possible. There’s a great video on Youtube to demonstrate the TX8 arms, against more conventional arms. You also get over 15 minutes of flight time, using two 3S 5000mah batteries. In addition to this, Brendan has put together a nice pdf detailing the assembly, and there is a complete list of all the electronics he used, to build his particular model. This is without question a big project, with 10 inch props, but just imagine how cool this thing will look in the skies. Looks really cool when you see the parts laid out in the image above. I have been 3D printing for years, and I still get a buzz every time something comes off the print bed. 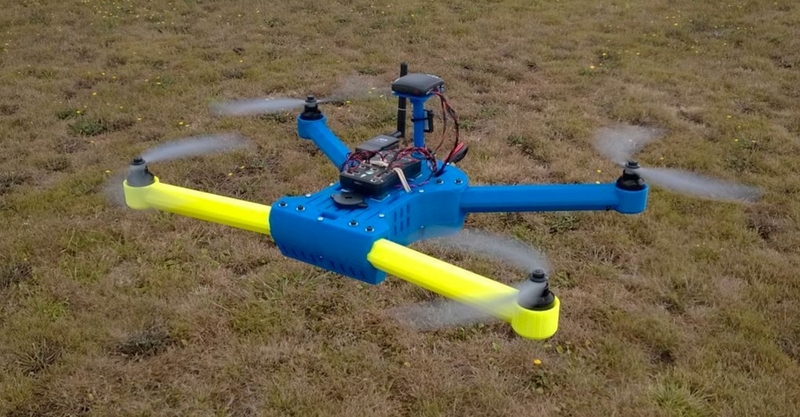 This 3D printed drone, the Peon230 quadcopter, is one of the most made RC vehicles on Thingiverse. It has been designed for strength, function, and most importantly light weight. All of the printed parts combined, come in at under 100 grams. The simple design is accompanied by three excellent videos. One showing you in detail, how to assemble the printed parts. Another showing the electronics, where to buy them, and how to install them. And finally, a test flight video, complete with a crash into a tree. There are also plenty of links to online stores, selling the various components. And a hardware list for the screws, spacers, and nuts. The popularity of this 3D printed drone, also means there is a large community of people sharing tips and ideas. 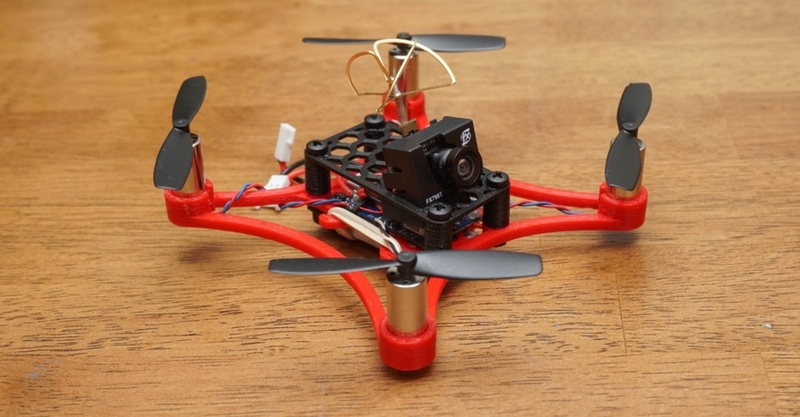 Another excellent 3D printed quadcopter to round off the list. I read years ago, that two technologies that were likely to be huge in the future were: 3D printing; and drones. I guess it’s not surprising that they have joined forces. The growth in both these areas has been exponential, and it shows no signs of stopping. It paints a really exciting picture of the future. I would dream as a child about owning some sort of radio controlled aircraft. However I was an adult before I finally got my first RC helicopter, and it was still very expensive. When you see this list, and what you can build at home for relatively low cost. It’s amazing. Something that has pleasantly surprised me too, is the amount of time and effort people have put into creating these 3D printed drones. Not just in the designs, but also in creating detailed instructions and assembly videos. Honestly, there are people who are creating better “support” than some mainstream manufacturers. I was considering buying a quadcopter from Align, but after researching this article, my mind has been changed. Now all that’s left for me to do, is choose which one I’m going to print and build. Please leave me a comment below, and let me know if this post was useful. Are there any 3D printed drones you think should be on my list? Hi! My fiancé loves 3D printing and drones, and I’d like to surprise him with a kit to make his own 3D printed drone for his birthday. Which of the above is the most “wow” in your opinion? I will need a list of the hardware needed so that I can make my own kit if the instructions don’t have that information (I’m not as great with electronics as he is, and probably how you all are!). I would go for the first one on the list if I were you. It’s designed by Daniel Noree who is responsible for a number of fantastic 3D printer models.